The secret template India uses to print currency notes has been "compromised" and that is possibly why fake but real-looking Indian currency notes are being pumped in, said the Central Bureau of Investigation (CBI), to subvert the country's economy, reports PTI. The CBI, the nodal agency for checking fake notes, has now formed a special team comprising its sleuths and officials from the Directorate of Revenue Intelligence (DRI), the Reserve Bank of India (RBI) and the Central Forensic Science Laboratory (CFSL) to find out how and at what level the design got "compromised". "Our investigations have revealed that the 2005 secret security template which was introduced as part of the new design adopted then has been compromised," CBI Director Ashwini Kumar said. Asked, if the country was still using the security template, he said, "yes". By using the word "compromised" the CBI means that the counterfeiters have deep knowledge about the kind of special ink, paper and other ingredients that go into the making of notes. Giving details of the investigation team, CBI spokesperson Harsh Bhal said "a special team has been formed which consist of officers from CBI, DRI, RBI and CFSL." "The team will investigate how and at what level the security template has been compromised," he said. Sources said the ink and paper that go into the making of currency notes are currently being imported from foreign countries which are a "matter of concern." Cabinet Secretary KM Chandrasekhar had earlier this month chaired a high-level meeting on the issue of fake Indian currency notes (FICN) that was attended by representatives from the RBI, IB, DRI, ED, CBI, CEIB, the Customs and the paramilitary forces, among others. It was decided at the meeting to take up the issue of FICN with the European countries, including Britain, which are exporting ink and currency paper to Pakistan from where most of the counterfeits originate. Media reports suggest that FICN even bore authentic series codes indicating the deep knowledge of anti-national elements about the security features. The CBI is also creating a national data bank of fake currencies, sources said, which they believe will help trace the origin of the fake notes and the areas in which it has been circulated. The government is also indigenising the production of a special paper to print the Rs 500 notes, the most frequently counterfeited currency in the country. 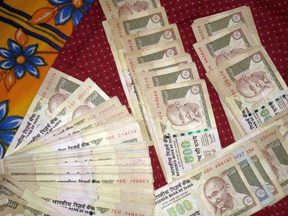 The Security Paper Mill at Hoshangabad in Madhya Pradesh, which is responsible for manufacturing currency papers for lower denomination and non-judicial stamp papers, has received the nod from the Ministry of Finance to produce papers on which the Rs500 notes could be printed. Earlier, this week, the RBI appointed committee has said that the central bank should constantly upgrade security features on currency notes to stay ahead of counterfeiters. The panel has also recommended progressive adoption of technology, both in respect of cash handling and security to counter the growing menace of fake notes in the country. The committee, however, noted that the number of fake notes in the country could be in the range of at 3-6 pieces per million, one of the lowest in the world.